after i fill 2/3 will freshwater i will add salt and powerheads....after salt is mixed up add rock to make sure firm on the bottom then add sand on top on if???? while cycling do i need to run lights..if so how long and what time? Most people will prob. reccomend keeping the substrate as open as possible, which means sand first and rocks firmly placed. You can use zip ties to hold rocks together to prevent slides. If you want to be inventive you can use acrylic rods or egg crate as a base for the lr to sit on so the sand is untouched and the bases are firmly planted...many options. 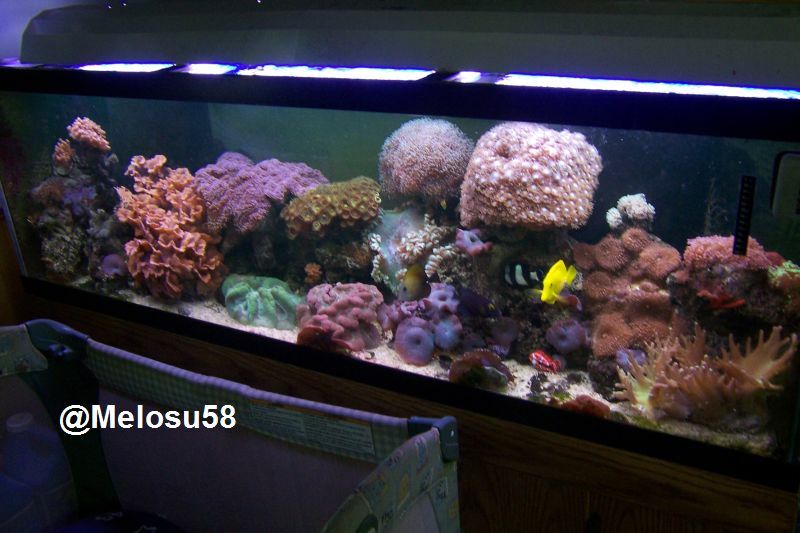 As far as lights, what types of coral are you interested in? You can go halides, pc's, etc...You can run lights while cycling or not, either way the tank is going to get diatoms and other algae growth till cycling completes. My recommendation would be to get some cheap base rock and set it on the glass, followed by the sand then the liverock stacked on top of the base. Reason being is alot of the fish you can get, like to burrow and you don't want them dislodging your rocks. Engineer gobies are notorious for this. With the lighting you have I'd just keep them off to keep the algae bloom to a minimum. You dont have to have lights to do the cycle. Another note, I would not add salt directly to the tank, even while cycling. I premix my water, this helped me get an idea of how many cups of salt to put in the water. would it be a wise idea to make an in-the-tank-fuge? something like a glass cude 5" by 5"? 5x5 isn't large enough to do much good IMO. If looking for a quick way to do it without building it in the sump checkout USA Refugium which sells HOB refugium starting at $25.